Bring the little monsters for a night of trick-or-treating at Atlantic Station! Participating restaurants and retailers will be open with special treats for trick-or-treaters from 5-6 p.m. on October 31. Look for the special trick or treat window decal or check with Concierge for participating retailers. 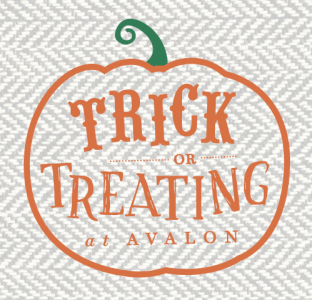 From 10:00 a.m.-2:00 p.m. on Saturday, October 28, 2017, bring the little ones to Avalon for free trick-or-treating . To find the candy spots, stop by the Concierge to pick up a Trick-or-Treat map & keep an eye out for window decals at participating retailers.